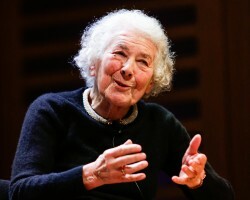 Barely had I written this appreciation of Judith Kerr for The History Girls than I discovered that When Hitler Stole Pink Rabbit was the subject of this month’s World Book Club programme on the BBC World Service. What joy! (Nb that is permitted usage of the exclamation mark according to new DoE regulations. The following isn’t.) One of my all-time favourite children’s writers talking to my all-time favourite books presenter, Harriett Gilbert! You can listen yourself or download the programme here. That delightful photograph was taken by Enda Bowe for Jewish Book Week.